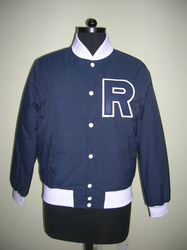 We are one of the most prominent name in market which manufacturers & exports all kind varsity jackets. 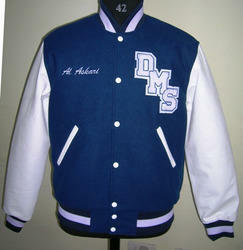 These jackets can be custom designed by us in accordance to their color, sizes, lining, patches etc. Also available at very competitive and market leading prices. 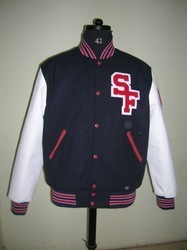 Classic Varsity Jacket in color combination made 25 colors in wool & leather. We have a specialized design team and any type of jacket, embroidery & chenille patches can be developed as per your requirement. We do any quantities starting from 1-1000’s of jackets. 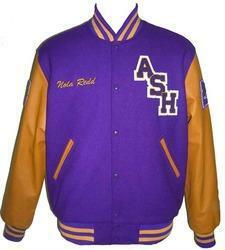 Being the most eminent manufacturer of garments, we present purple & old gold Varsity Jacket. These jackets are highly appreciated and demanded for its basic features like softness and excellent fitting. These garments can be customized in terms of size, color, and design. chest "ASH" CHENILLE PATCH, NICKNAME EMBROIDERY. Packaging Details: packed in poly bag with box and 17 pieces /box. We contain in our store, Red and Black Trendy Jackets, which is a buttoned jacket having side pockets in it. These jackets are skin friendly and available at reasonable and market leading prices with durability and good quality. Customization in form of sizes and colors of these garments is possible as per the requirement of customers. chest "R" CHENILLE PATCH, NICKNAME EMBROIDERY & BACK CHENILLE PATCH. These high royal and Bright white sleeves Varsity Jackets are made from high quality of raw material which ensures durability at its user end. These Black & White Varsity Jackets are appreciated by large number of clients. These products are available in market at competitive rates. chest "DMS" CHENILLE PATCH, NICKNAME EMBROIDERY. Non reversible jacket made of fleece with chest embroidery..